The University of Edinburgh (Scottish Gaelic: Oilthigh Dhùn Èideann), founded in 1582,is a renowned centre for teaching and research in Edinburgh, Scotland. It was the sixth university to be established in the British Isles, making it one of the ancient universities of Scotland. The university is also amongst the largest in the United Kingdom. The founding of the University is attributed to Bishop Robert Reid of St Magnus Cathedral, Kirkwall, Orkney, who left the funds on his death in 1558 that ultimately provided the University's endowment. The University was established by a Royal Charter granted by James VI in 1582, becoming the fourth Scottish university at a time when more populous neighbour England had only two. By the 18th century Edinburgh was a leading centre of the European Enlightenment (see Scottish Enlightenment) and became one of the continent's principal universities. 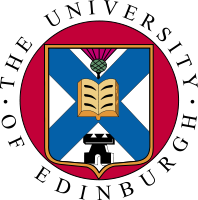 Students at the university are represented by Edinburgh University Students' Association (EUSA), which consists of the Students' Representative Council (SRC), founded in 1884 by Robert Fitzroy Bell, and Edinburgh University Union (EUU) which was founded in 1889. In 2002 the University was re-organised from its 9 faculties into three ‘Colleges’, and now comprises the Colleges of Humanities and Social Sciences (HSS), Science and Engineering (CSE), and Medicine and Veterinary Medicine (MVM). Within these Colleges are 21 ‘Schools’, which are of roughly equal sizes, generally significantly larger than the more-numerous departments they replaced.